Minford’s Caitlyn Puckett is boxed out by Miami Trace’s Shaylee McDonald during the Panthers’ 54-45 win over the Falcons Monday evening. Minford’s Livi Shonkwiler shoots during the first half of Monday’s 54-45 loss to Miami Trace. Minford’s Hannah Tolle shoots over a pair of Miami Trace defenders during the Falcons’ 54-45 loss to the Panthers Monday evening. MINFORD — If there’s such a thing as a good loss, Minford experienced one Monday night. 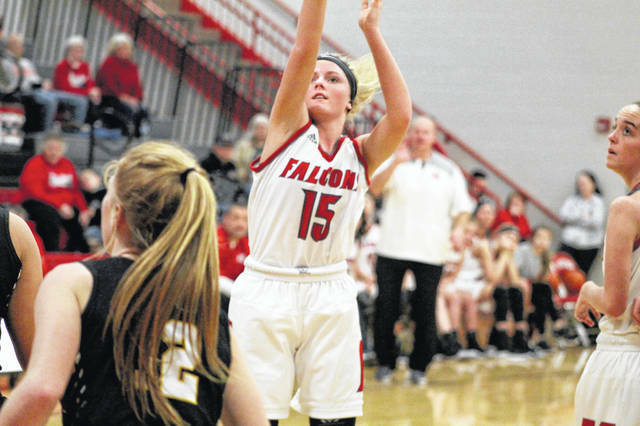 The Falcons (10-3) ran into a talented Miami Trace team in non-conference play, falling 54-45. However, there are many lessons they can take out of the outcome and, if you’re going to lose a regular season game, it’s best to do so against an out-of-conference Division II program. 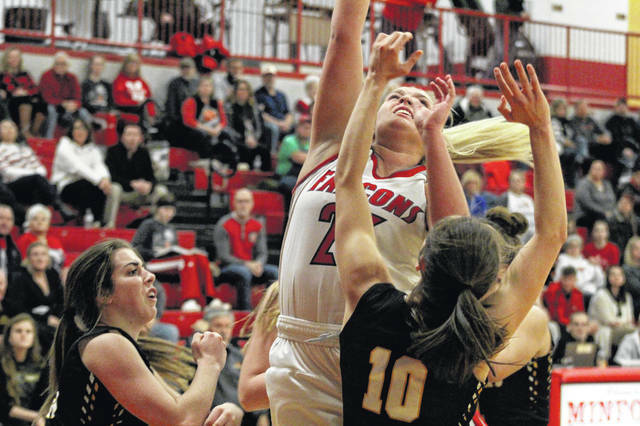 Minford’s tournament seed will likely be unaffected and the Falcons can only get better from it. Leading Miami Trace (8-4) to the victory were, without question, guards Shaylee McDonald and Cassidy Lovett. The pair combined to score 31 points and 11 rebounds. “[Miami Trace] is guard heavy and their guard play is phenomenal,” Davis said. After starting the season 2-3, the Panthers have now ripped off six wins in their last seven tries. Speaking of size, Miami Trace had trouble containing Minford’s 6-foot-2 center Ashley Blankenship. The senior scored a game-high 22 points and brought down 13 rebounds. But in the second half, the Panthers doubled Blankenship and her teammates couldn’t knock down the shots necessary to keep Minford in the lead. The Falcons darted out to an 8-0 lead with 6:03 left in the first quarter after Caitlyn Puckett, Ashley Blankenship and Livi Shonkwiler got the scoring started. With Minford leading 14-9 with less than 30 seconds left, MT’s Olivia Wolfe drilled a 3, cutting the lead to 14-12 after one. In the second, the two programs took turns trading punches. Behind Blankenship and Puckett, the Falcons grabbed a 27-22 lead with 2:22 left before halftime. But Wolfe hit another 3, followed by two free throws from Becca Ratliff, to knot the score at 27 before a 28-28 tie at half. The third quarter, however, belonged solely to the Panthers. Miami Trace took its first lead with 7:39 remaining, thanks to a bucket from McDonald, before she hit a 3 at the 5:58 mark to give the Panthers a 34-30 advantage. That was the start of a 12-2 run and, before Minford could blink, McDonald and Miami Trace had a 42-32 lead. Heading into the fourth, the Panthers’ lead was eight at 44-36 after Lovett beat the buzzer with a lay-in. In the final eight minutes, Miami Trace grinded down the clock, hit its free throw attempts and relied on McDonald and Lovett to put the game on ice. Blankenship led all scorers with 22 points alongside 13 rebounds while Puckett added 11 points to Minford’s total. Shonkwiler finished with eight points and five boards and, while Hannah Tolle failed to score, she was a factor on the glass, totaling nine rebounds. McDonald led the Panthers with 18 points and seven rebounds, Lovett added 13 points, four rebounds and a pair of assists, and Wolfe ended the night with 10 points. 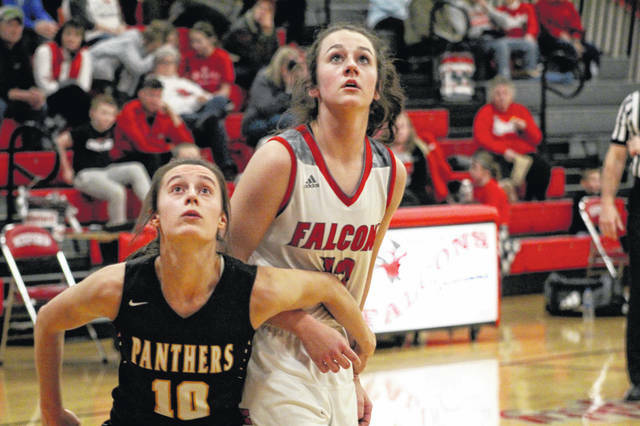 Minford’s turnaround time isn’t long as the Falcons travel to Oak Hill in an important Southern Ohio Conference matchup Thursday. Miami Trace: 19-48 FG, 9-12 FT, 7-19 3pt., 16 rebounds (McDonald 7), 11 turnovers, 4 assists (Lovett 2). Scoring: McDonald 18, Lovett 13, Wolfe 10, Stewart 5, Ratliff 5, Payton 3. Minford: 19-45 FG, 7-9 FT, 0-4 3pt., 36 rebounds (Blankenship 13), 20 turnovers, 6 assists (Shonkwiler 2, Slusher 2). Scoring: Blankenship 22, Puckett 11, Shonkwiler 8, Slusher 4.